The 30" cutter is built specifically to handle 20 in./50 cm squares at a diagonal. The RCT 30 is precision-designed to cut a variety of "soft tile" products, including vinyl tile, carpet tile, resilient tile, and more! Get the versatility you need! The NEW RCT Magnum Shears are specifically developed for cutting design tile, carpet tile, luxury vinyl tile, rubber, cork and most other Vinyl/PVC-based products. A solid steel blade produces a factory edge on most types of soft flooring products. The RCT Magnum Shears feature a unique Precision Square Technology Fence that can be easily squared (or slightly off-squared) to the blade to make the accurate cuts you need in every situation. 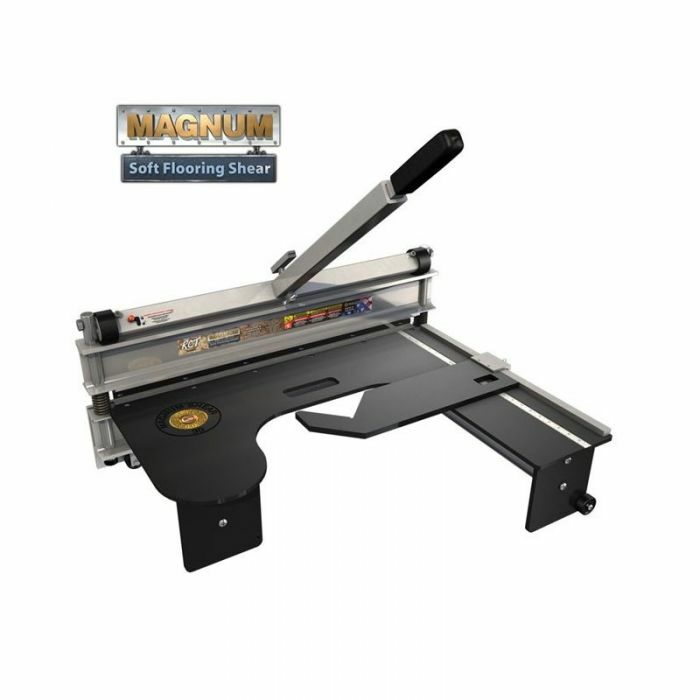 The RCT Magnum Shears also include a Wall Gauge System which automatically measures the length of your cut when you set the machine at the edge of your last tile, an innovative Angle Guide with a Precision Ruler which allow for exact measurement on both 90-degree and 45-degree angle cuts, and a unique castor system that allows the machine to roll parallel to the wall.